THANK YOU to everyone who came out to the advance screening of TRAINWRECK last night. We had a great time and I love connecting with my FilmFashionFun.com readers in person. I laughed so hard that my diet coke went up my nose. Follow up post about the film to come later this week. TODAY is Amazon Prime Day. Prime Day is a one-day shopping event on July 15, 2015, with more deals than Black Friday. Prime members can shop exclusive deals from electronics, toys, video games, movies, clothing, patio, lawn and garden, sports and outdoor items and more. Not a member of Amazon Prime? Just click here to join and enjoy immediate access to all of the deals. What’s the big deal about having Amazon Prime? It gives you FREE 2-day shipping on anything your order from Amazon plus many more benefits. If you can think ahead you can get a lot of Christmas shopping done now. What are these great deals you ask? Well, that’s the trick. You have to become a member before you can see the discounts. But from what I can see, the deals are pretty incredible. These Ray-Ban Aviator sunglasses are $79.05 today and they are normally $150.00. Not to be outdone, there are some brick and mortar retailers trying to get your business by offering some pretty good deals. And don’t forget that the Nordstrom Anniversary Sale opens to the public on Friday, July 17th. If you need some ideas for that sale, click here to read this blog post. I have a pretty good strategy that I use every year. As always, just click the pink links in any of my blog posts to directly connect to the items/retailers I am talking about. By the way, did you know that every single blog post stays on this site? It’s all archived for you. If you want to recall any blog post, you simply put the topic in the “Search film+fashion+fun” bar in the top right corner of this page. For example, if you put in “kitchen remodel” it will take you to any and all the blog posts I did about our kitchen remodel. Just thought I would relay that little fun fact. BONUS: I have teamed up with some amazing bloggers to bring you this fun and fab giveaway! As always, we appreciate all of you so much, that’s why we regularly do giveaways to reward our precious readers and followers. 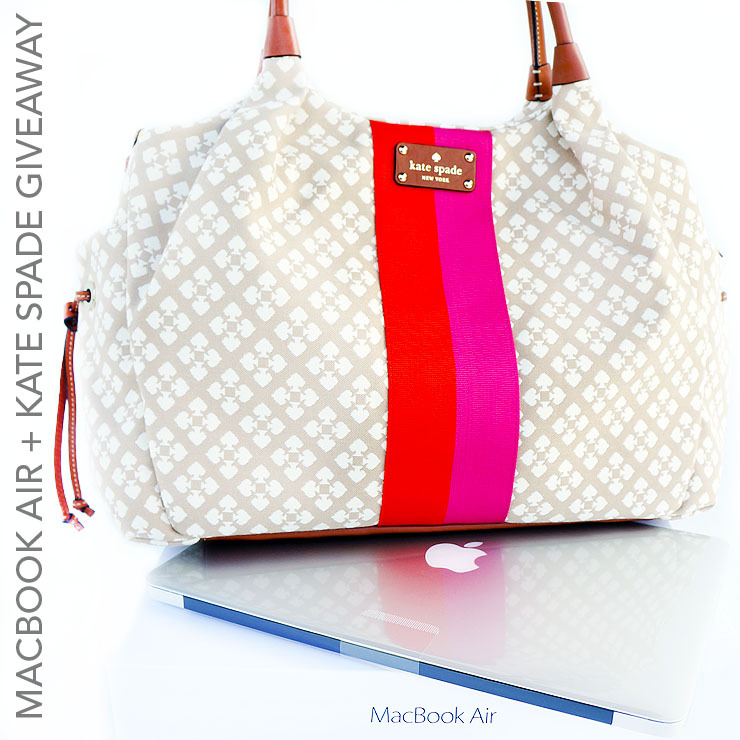 One lucky reader will win this 13.3 silver Macbook Air worth $1,199 and a Kate Spade tote that you can use as a carrier for your Macbook Air and carry it in style wherever you go. The total value of the prizes is $1,600. Open to international contestants but international winner will be responsible for shipping and custom fees. Just click below to send in your entries. Good luck!